The updated DMP Virtual Keypad App contains more features for mobile devices with the Version 5.3 software update on Apple and Android. Users can take advantage of the updated customizable Home Screen tab. Customize the Home Screen tab with frequently used favorites and cameras for easy access. Users can also take advantage of an updated Thermostat tab in both iOS and Android apps. Users can swipe left or right between thermostats. New color schemes help to easily identify what setting the thermostat is in currently: Auto, Heat or Cool. With Version 5.3, Virtual Keypad users can now use the Apple Watch on iOS systems. Apple Watch function includes Arming/Disarming, History and Favorites. For more information on the new functionality, please view the complete Technical Update, TU-0859. False-Alarm Reduction. 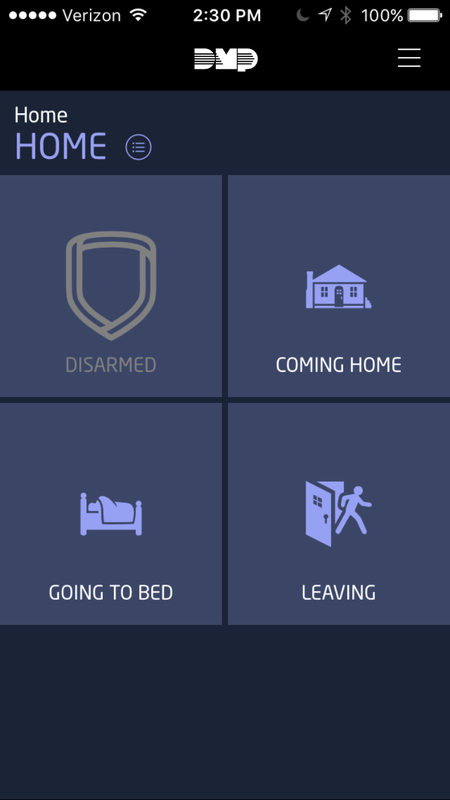 When receiving a burglary alarm Push Notification, “Is This A False Alarm?” is displayed, allowing the user to confirm or cancel the alarm by tapping "Real Alarm" versus "False Alarm" on the screen. Door Control & Lockdown: Lock and unlock doors, and initiate lockdown for all public doors and Z-Wave locks (XR150/XR350/XR550 systems). Rooms with a View: Allow users to watch real-time device activation when clicking on hotspots embedded in the associated video stream. Camera Settings: Record on motion & alarm, flip image, and motion detection regions. Access all App features through an elegant, intuitive interface. Virtual Keypad 5.3 from DMP Alarms on Vimeo.